The Moving Average Indicator is one of the most popular and easy to use tools available. By using an average of prices, moving-averages smooth a data series and make it easier to spot trends. Moving-averages are lagging indicators. They confirm that a stock trend change has occurred, but only after the fact. They also help determine if an existing trend is still in motion. They follow the trend. They smooth out a data series and make it easier to identify the direction of the trend. Because the stock chart moving-average is a lagging indicator, they fit the category of trend following. When prices are trending, moving-averages work well. However, when prices are not trending, they do not work so well. For further in-depth information on the Moving Average Indicator, this resource contains critical information to help you learn to use stock charts and technical indicators in a clear, simple and concise manner to improve your trade entries and exits. The SMA is an average of a stocks closing prices over a selected time span. For example, a 50 day moving-average would be calculated by adding the closing prices for the last 50 days and dividing the total by 50. And the moving-average moves because as the newest period is added for the most current day, the oldest period, 50 days previous, is dropped. In other words, as new days are added, the old days will be subtracted and the moving-average will continue to move over time. The 50 day SMA is shown above in red. In order to reduce the lag in SMA’s, stock traders sometimes use exponential moving-averages. EMA’s reduce the lag by applying more weight to recent closing prices relative to the older prices. The method for calculating the EMA is fairly complicated. The important thing to remember is that the EMA puts more weight on recent prices. Therefore, it will react quicker to recent price changes than a SMA. 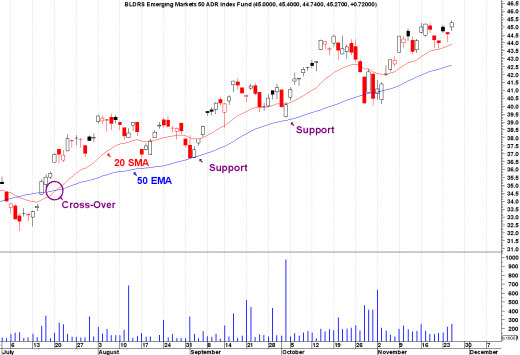 The 50 day EMA is shown above in blue. Exponential-Moving Average vs the Simple-Moving Average: Which is better? The answer to that question depends upon your stock trading style and preferences. The simple moving-average has a larger lag, however the exponential moving-average may be prone to quicker moves. So most often, stock traders prefer to use the EMA for shorter time periods to capture changes quicker. While the SMA is used over long term time periods to identify long-term trend changes, such as the 200 day moving average. Also, much will depend upon the individual stock and how it reacted in the past. This is where moving-average analysis of individual securities is a must. The shorter the MA, the more sensitive it is, and the more signals, false and real, will be given. The longer the MA, the less sensitive it is, the fewer the signals that will be given. And less sensitivity signals leads to more reliable signals, but they can be too late. In the end, you as a stock trader, should experiment with the different moving-average lengths and types to examine the trade-off between sensitivity and signal reliability. Also, as with most technical analysis tools, moving-averages should not be used on their own, but in conjunction with other tools that compliment them. If the MA is moving up and the price is above the MA, the trend is considered up. And if the MA is declining, and the price is below it, the trend is considered down. 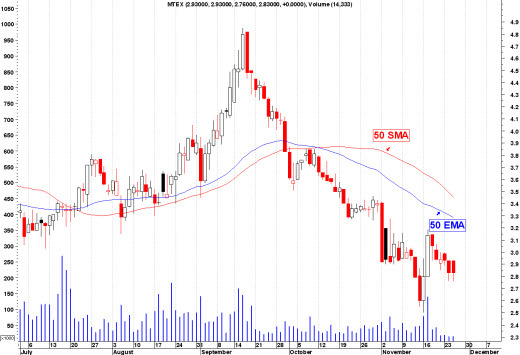 A system using a 50-day SMA would be deemed medium-term, and 200-day SMA would be a long-term trend. Also if a short term MA, like the 20 EMA, is above a long term MA, such as the 50 SMA, the trend is considered up. And visa versa. See the stock chart below. This is usually accomplished with using one moving-average and is based upon historical precedent. For example, in an uptrend, a price close below a moving-average line is a warning of a potential price change, or trend direction. And if the MA turns down as well, the negative signal becomes much stronger. Many time, a stock price will drop to their up-trending MA, and bounce back up and resume it’s positive trend. This is considered support. As long as trading volume on this price drop is low, the trend should stay in tact. The 50 SMA is a very powerful support level. Why does this indicator work so powerfully? The answer lies with a long term habit by institutions and fund managers. These deep pocketed investors cannot buy and sell on the same signals that small time traders can. Profitably investing ten thousand dollars is far easier than trying to invest ten million dollars and have it appreciate over time. Because of this, institutional investors often rely on simple and broad indicators to buy and sell that have proven themselves over time. The 50 day moving average is one such indicator. As stated above, the trend is considered bullish as long as the shorter MA is above the longer MA. Moving average crossovers are quite often used as a trigger for a buy or sell signal. Any crossing by the shorter moving-average above the longer moving average is considered positive and bullish. And any crossing by the shorter moving-average below the longer moving average is considered negative and bearish. And when the distance between the two averages begin to narrow, that is usually an early warning that the uptrend is losing some momentum. See the stock chart above. Also, moving-averages are important when using a Swing Trading system. Moving-averages are effective tools to identify and confirm trend, identify support and resistance levels, and develop trading systems in the stock market. The ADX, Average Directional Index, is also one indicator tool that can help identify stocks that are trending. A final note, do not expect to get out at the top and in at the bottom using moving-averages. Is there a specific Moving Average Strategy or Technique that you use, that is not described on this page? Here is your opportunity to share your Moving Average Indicator expertise and technique, to help and coach other newbie Stock Traders become more proficient and confident on their journey to Stock Trading Success and Profitability! I am using EMA 9/18 when it cross over ,if 9 is down I sell and when 9 is up I buy. Return from "Moving-Average" to the Home Page: "Stock Market For Beginners"